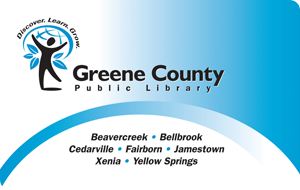 To contact Greene County Public Library, please select a subject and fill out the form below. You can also email us at comments@gcpl.lib.oh.us. Self-service support is also available through extensive and user-friendly FAQ and other written help that is accessible through the OverDrive Digital Downloads website help pages. Look at the back of your library card, and enter the final five numbers that appear under the barcode. Please indicate your home library and/or preferred location to pick up materials. Ask a short, specific question. Include: full names, dates, and residences of the ancestor(s) you are seeking. There is a charge of 25¢ per page ($1 minimum) for copies. We will send a bill with the copies, payable upon receipt. Please keep in mind that we are located in Ohio, and our historical collection is focused on information from Ohio and some surrounding states. Tell us what type of recommendation you're looking for in the message box below. Please be as specific as possible. Be sure to tell us whether you're looking for fiction or nonfiction recommendations. You should also feel free to let us know what authors you normally read, what subjects interest you, and anything else you think would help us. Use this form to submit simple or factual questions (for example, "What is the capital of Peru?") to our information staff. We will try to send an answer within 12–24 business hours. Tell us about your suggestion. Use the message field to let us know why you think we should add the item to our collection.